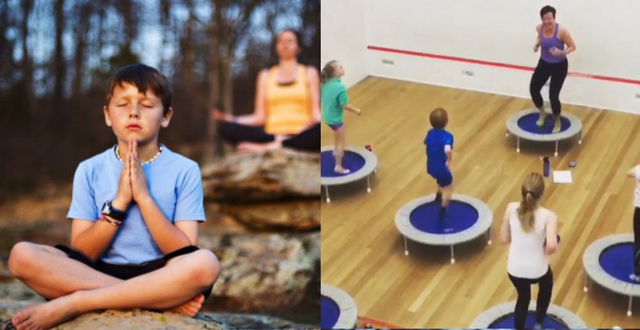 A fun exercise program in a non-competitive, relaxed environment, where your children will get to explore their own bodies and mind and release stress and tension. In this program designed specifically for children, Sarah Fletcher (Quiet Mind Meditation) and Gaby Robinson (U-bounce Fitness) are combining invigorating and energising rebounding exercises (in a fun, happy and playful way) to release any tension or anxiety and tap into our happy hormone stores, with the quieter mindfulness of movement practices (based on qigong, yoga and tai chi ) to encourage the body and mind to naturally shift inward. Worrying thoughts, anxiety, mental and emotional tension will be silenced, as we sit calmly for a guided meditative exercise to engage and quieten the mind. These are life skills that can be taken into daily life to release stress, rebalance the breath and heighten self-awareness. 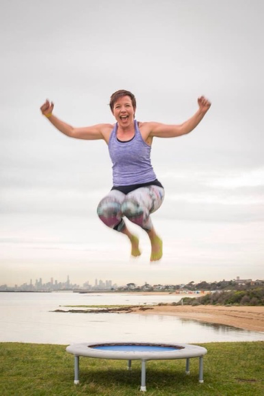 Gaby discovered rebounding as part of her fitness journey about 6 years ago, when she turned from couch potato to fitness lover and subsequently completed a fitness certificate to teach and enlighten others about the magic fitness can provide to your body , mind and soul. U-bounce Fitness was born in October 2014 and has been bouncing around Bayside ever since. Gaby is passionate about people of all ages and making them feel happy and healthy, in particular she loves children and their enthusiasm for rebounding and life in general. They are naturally drawn to it. She has two children (one pre-teen & a teenager) who now have rebounding as a part of their daily life. Please email : getfit@ubounce.com.au or call Gaby (0438 319 918) for an enrolment form with all details. Numbers are limited to 12 children.